Realizing that you’re in the midst of one of the best experiences of your life always feels pretty strange. Although such a sensation is usually reserved for big, life-changing events–your wedding day, the birth of your child, etc.–I found it a little while ago aboard a yacht named Jolly. Yup, I was on a yacht. 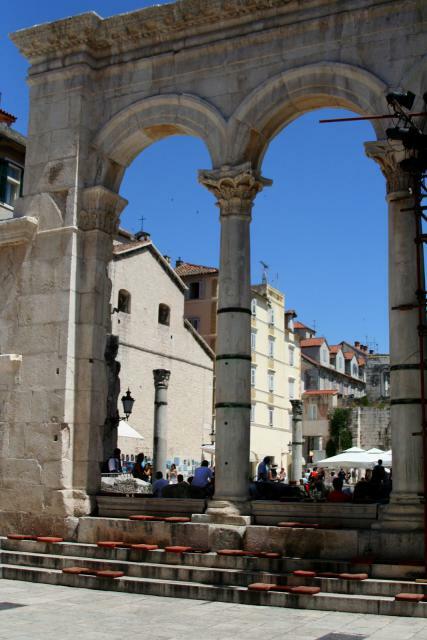 Here’s how it happened: Todd, Heather, Derek and I arrived in Split, Croatia and, after an amazing couple of hours spent exploring Diocletian’s Palace–which was built in 305 A.D. (!?!) by a Roman emperor who planned to use it as his retirement home–we found ourselves in need of a plan for the next few days. 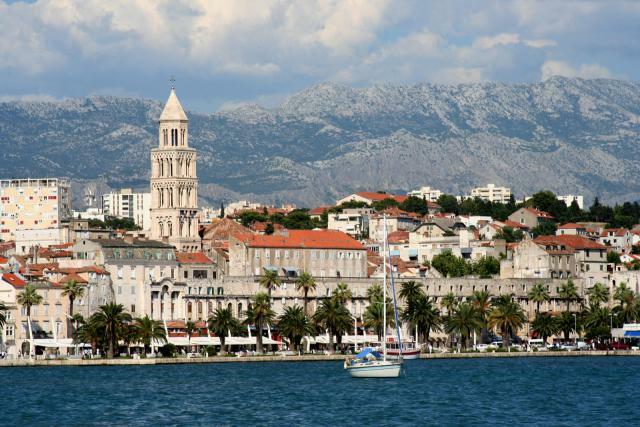 Todd mentioned that he’d read that it was possible to charter a yacht for a few days and island-hop among Croatia’s gems in the Adriatic Sea. Although each of us was certain that such a luxury was far beyond our budgetary reach, we set off to check it out anyway. The day was sunny and hot, and the pull of the marina, with its turquoise water and its rows of sparkling boats, was irresistible. 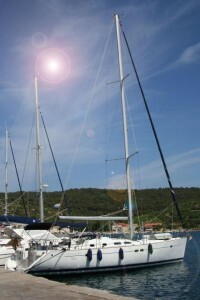 Upon our arrival at the marina, we confirmed our earlier expectations that–no kidding–renting a yacht was expensive. We set to work applying negotiating skills that would make our respective law schools proud, and we met with some success (mainly because it was a truly last-minute rental). We researched all kinds of options. We hemmed and hawed. We vacillated. And then we saw the Jolly. We fell immediately in love. A 47-footer she was, and only a couple of years old. She offered all kinds of space in which to lounge and–we were all certain–to have the best time of our lives. We couldn’t help ourselves; we hired a skipper named Damir and signed on the dotted line. And so there I was, book in hand, lying on the front of a yacht in the Adriatic. When we got hot, we dropped anchor and swam in the sun-drenched sea. Later, we docked at a small island named Vis and made our way, per Damir’s advice, to a small, family-run vineyard in the middle of the island. We feasted on fresh fish and lamb and returned to the Jolly to be lulled to sleep by gentle waves. The next morning, I went for a run (my favorite way to explore a new place) and realized that the town in which we’d docked, which was also called Vis, was even more idyllic than I’d previously imagined. Inspired, I set off, camera in hand, to capture some of what I’d seen. I happened upon a produce stand where fresh figs were sold (delicious! and impossible to find at home…) and returned to the boat to eat them alongside some incredible cheese that Derek had procured. 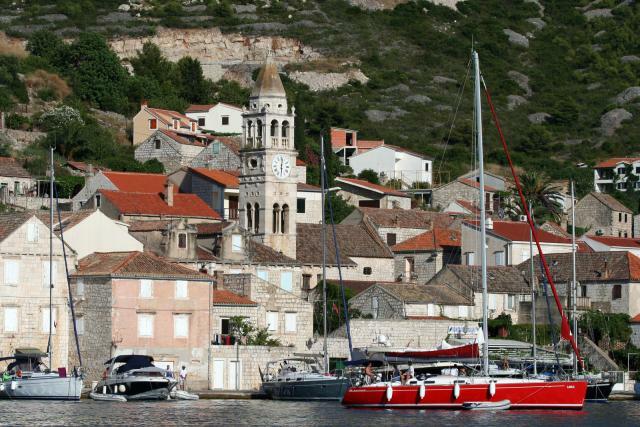 Soon thereafter, we set sail for another part of Vis, a small town called Komiza. The whole thing felt like a scene from a movie. It also felt like utopia. From there, things went slightly downhill, primarily due to Damir’s abject laziness and to some rather uncooperative weather. Seemingly deaf to our repeated requests to please use the sails (first of all, because we were on a sailboat and wanted to experience it in its full glory and, second, because gas is even more expensive in Europe than it is at home) and to drop anchor at some of the delightful-looking coves that we were whizzing past, he motored from one port to another without so much as a moment’s pause. On our third day aboard the Jolly, he told us that it was too windy to move the boat at all. What could we do? We gave up our dreams of spending the evening in Hvar (a nearby island that is famous for its nightlife) and instead rented scooters and explored Vis. Exhibiting brattiness befitting someone aboard a yacht, I whined to Derek that, “it’s not called island-hopping if we stay on the same island the whole time.” It wasn’t my proudest moment. 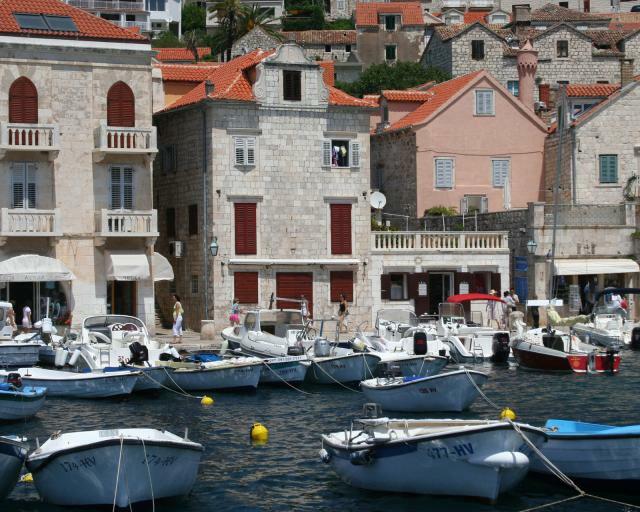 As it turns out, we were able to spent a little time on Hvar on our fourth and final day at sea. We wandered its cobblestone streets for a couple of hours and paused for a snack in a sidewalk cafe. By the time we docked back in Split, we were sun-burned, exhausted and happy.